Busy night in London town tonight, art wise there are lots of great shows opening across the city. We blogged about Stolen Space's Christmas Winter Warmer's show (here) earlier in the week, which also opens tonight 3rd December. Alongside the show the gallery will also host the launch party of Issue 10 of VNA magazine. 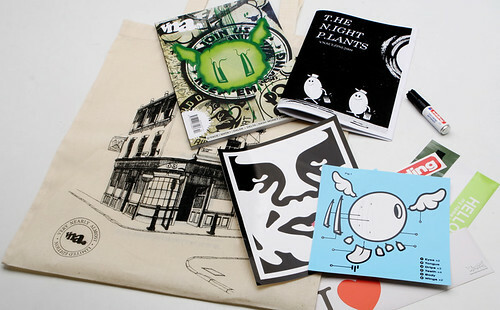 There will be some super limited editions of the magazine with 100 available on the 3rd of December with a screen printed cover by D*Face plus a one off zine by London street artist A.CE, Stickers from D*face, Obey and more, marker pens and all sorts of other extras all inside a screenprinted tote bag. Plus 50 screen printed covers sent out in the general run to be hunted down in bookshops across the world. VNA Issue 10 from Make Some Tea on Vimeo. As well as all the limited stuff the new issue of the magazine itself sounds like it's gonna be super fresh. It will feature an interview with graffiti legend Shok-1, a feature on artist, illustrator Jess Douglas, our coverage of this year Fame Festival in Italy, including a bunch of photos taken by us here at Hookedblog, JR in Paris and the ARTotale festival, plus a piece on Thierry Noir and his paintings on the Berlin Wall in the 80’s and also a feature on the shoe customiser Nash Money. Gonna be an awesome evening you do not want to miss. See ye there!